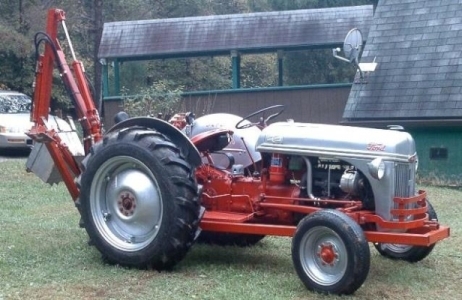 This web site is for new owners of antique tractors, especially Ford, N-Series tractors built from 1939 to 1952. Everything is completely free of charge. There is no sales pitch, and no hidden "members only" content. There is even an INDEX because it was becoming impossible for me to find information on my own site. Please forgive the in-line ads, they are what allows this site to remain completely free. This web site does not use any annoying pop-ups or chat boxes. This is where you might expect to see something like, "No tractors or humans were injured by the projects and activities described on this web site". Unfortunately, that would be false. In fact, several tractors have been completely disassembled. Parts of some tractors were used to repair other tractors. Some parts have been sold to the highest bidder. [Tractor parts, not human parts] Playing with tractors, rusty fasteners, welders, hand, and power tools will never be completely safe. We can try to be safe, but accidents do happen. There are times when we should be using a professional stunt-double. Assorted Band-Aids and antiseptic on-hand in the shop will save many trips thru the house for minor repairs. Your spouse will be happier if some of the grease and blood stays outside. If it has been more than 10 years since your last tetanus booster, have a doctor bring your immunizations up to date. If you choose to use the information published on this web site, please understand and take responsibility for the inherent risks. 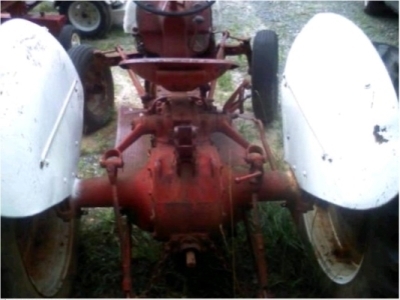 Normal, healthy people should not buy an old gasoline tractor. Normal, healthy people will not have any fun working on an old gas-engine tractor. Normal, healthy people will spend way too much to get "professional" maintenance. Normal, healthy people will be much happier with a small diesel tractor. 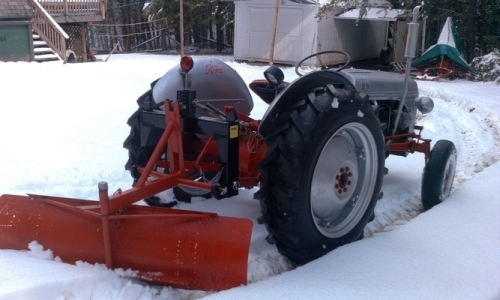 First-time tractor owners should have lots of questions. Please do not be too embarassed to get a quick lesson in tractor operation from the salesman or previous owner. The only stupid question is the one not asked that could have saved time, money, or prevented an injury. Get The Manuals! It is unfortunate that most modern manuals are poorly-translated Chinese, with any useful information completely buried by all the unnecessary warning and caution statements. Most of us toss the useless manuals out with the rest of the packaging. That was not the case when these tractors were built. The Operator's Manuals are very well written, and loaded with very helpful information. "Get the Manuals" appears in many places on this site. This generates no revenue for me, it's just my best advice for the new owner of any machine. The Operator's Manual, Shop Manuals, Parts Books, and other printed information for most tractors are easy to find on Amazon and other sites. The images below are links to a site that sells manuals on CD. 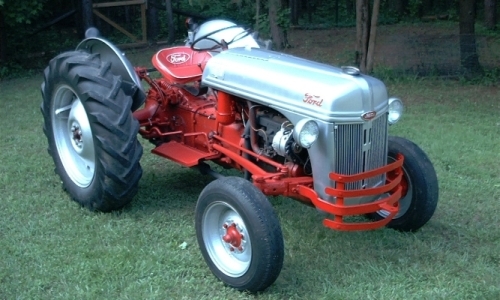 Parts are easier to find for the Ford N-Series than for almost any other old or new tractors. It helps that Ford sold well over a million of them (if we include the NAA in the series). 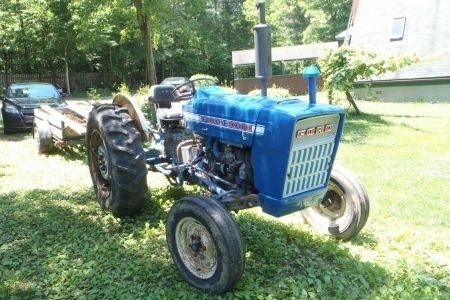 It has been much more difficult (and expensive) to find parts for my 1971 Ford 3000 tractor. Normal service parts (such as filters, hoses, points, plugs) are very reasonably priced. Buy good new parts from someplace like just8ns.com. Shopping cheapest price for new parts will only buy junk that looks new, but won't fit well or last (if it works at all). New restoration quality parts such as sheetmetal, headlights, and castings are getting expensive. Used original parts generally fit better and are much cheaper. The best trick to finding good used parts is to catch the right ads on ebay. I have been buying and selling used parts on ebay for many years with mostly good results. If you really need a part, and don't have time to shop around, what I have is mostly for sale at current market value. Some of my collected parts are listed on my PARTS PAGE. For the best retail new parts follow the various links provided on my LINKS PAGE. If you got here searching for free wiring diagrams, all of my 6 volt and 12 volt tractor wiring diagrams can be found and downloaded from my MAIN 12 VOLT PAGE. Even better, get the Pictograms created by JMOR. These are photos of the actual electrical parts with proper wiring . No.1—1948-49 Ford 8N with 1940 9N Engine (parted out). 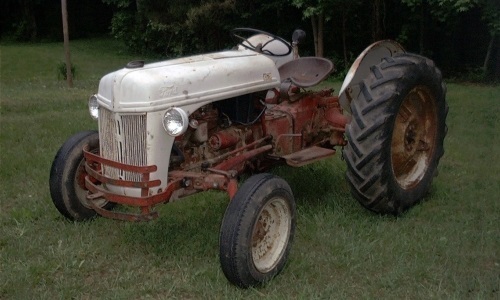 No.2—1952 Ford 8N (Working Tractor). 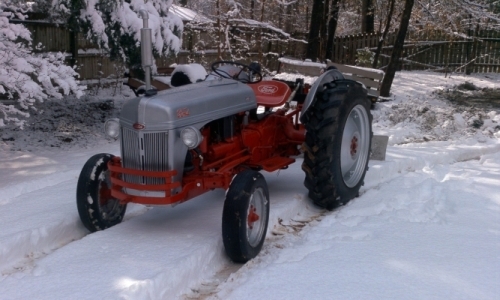 No.3—1946 Ford-Ferguson 2N (Working Tractor). No.4—1951 Ford 8N (V8-8N Project). 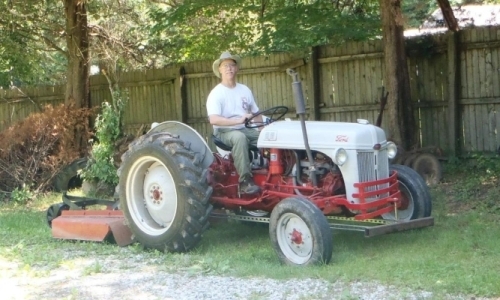 No.5—1971 Ford 3000 (Working Tractor). 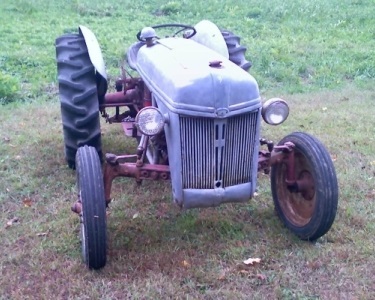 This Is My Main Ford 8N Tractor Web Site. These web pages cover Ford N-Series Tractor Repairs, Parts, Tool Kit, 6 volt wiring, 12 volt conversions, free wiring diagrams, paint colors, tune up, Marvel/Schebler carb tuning, and a bunch of other related stuff. There is a lot of information available here. The best way to find anything on this site is to click the Index A-Z button found at the top of every page. 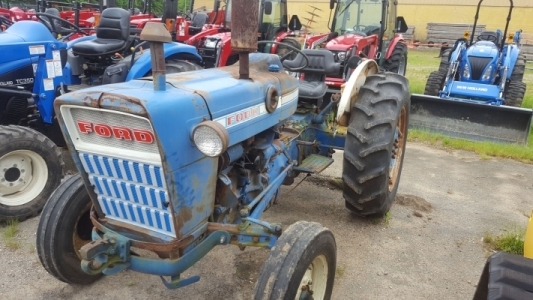 As you can see from the last entry on the list of tractors, this site will be adding information for some of the "newer" Ford tractors. 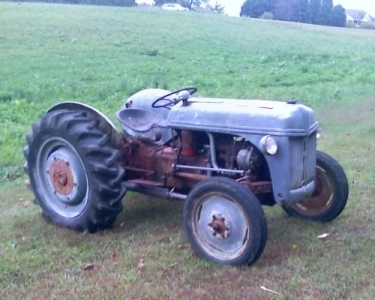 This is a picture of my first REAL tractor, May 18, 2005. It was obviously neglected, but the initial list of repairs was not too bad; the radiator was leaking, air cleaner was dry, fluids were dirty, hoses and tires not so good, and the steering was very loose. On the plus side; it started on the first try, ran great, and the hydraulics worked. 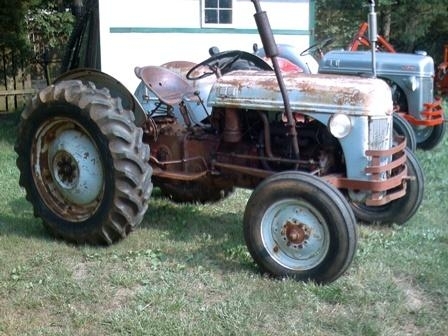 My "new" tractor was a 48 or 49 FORD 8N. 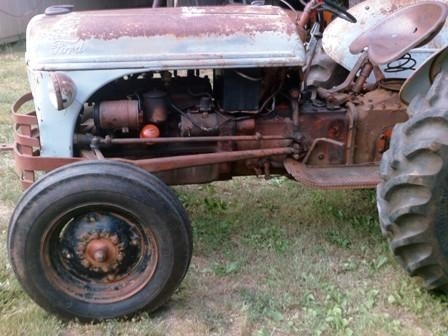 After a more detailed inspection, the engine serial number was a 1940 9N tractor. All the other castings, sheet metal, and parts were standard 1948 or 1949 8N tractor parts. That isn't a typo, the engine block really is from a 1940 9N. Why did I create these web pages? 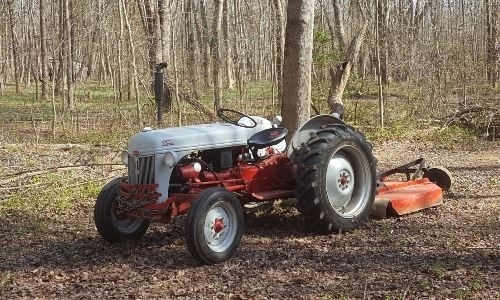 All I wanted was a small tractor to maintain our driveway, and maybe do a few other chores on our 12 acre, mostly-wooded property. This is where background music should start playing "Another One Bites The Dust". What should have been a relatively simple purchase, mushroomed into a full-blown hobby, disease, or obsession (depending on who you talk to). Honestly, all I wanted was a used tractor! How did I end up creating, and maintaining this web site? Prior to this, I knew very little about farm tractors, and absolutely nothing about creating or managing a web site. 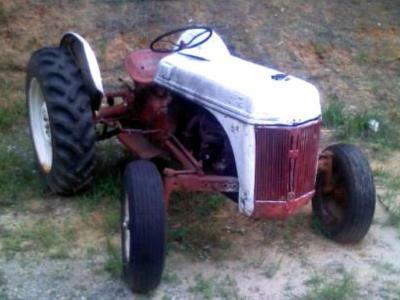 The web site started as a place to put before and after pictures of my first tractor. I was proud of the refurbished machine and wanted to publish some photos. Uploaded disassembly photos were very convenient to access for reassembly. 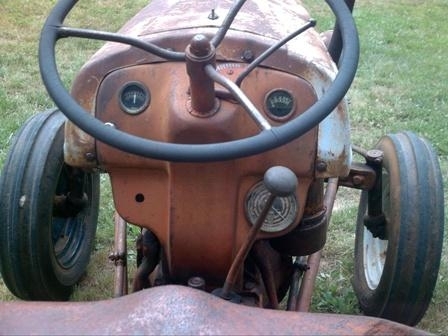 Photos led to descriptions that generated feedback from many other first-time tractor owners. It soon became obvious there was a genuine need for a site that was dedicated to the simple stuff any tractor newbee needs to know, but might be afraid to ask. Most on-line forums can be a very scary place for a newbee to start asking dumb questions. Perhaps the main reason for this site was personal convenience. Paper manuals do not survive very long in a barn. A small laptop, tablet, or even a cell phone can access wifi, and get on the web. All I need is a bookmark to my index and all the information on my web site is available on my screen. One big problem with any internet search is the total freedom to upload bs. Every question asked on every forum generates a range of replies that have to be run thru a filter. It is a fact that the amount of energy required to refute bs is at least an order of magnitude larger than is being expended to produce it. Publishing my own web site provided a place to save good information that I can look up and use without a filter. This photo was taken on July 10, 2005 after about six weekends of work, including normal weekend chores (some chores were neglected). NEW PARTS included a Made-in-China Radiator (that almost fit), Rear Wheels and Tires, Fuel Line, Hoses, Gauges, Lights, Wiring, 12 Volt Battery, Battery Cables, and a Seat Cushion. REPAIRS included adjusting the steering box, changing fluids and filters, welding up rust holes in the air filter oil cup, 12 volt conversion, lots of scraping, cleaning, priming, and painting. This was a lot of work, but new wheels and tires were the only big expense. Most of this was low or no cost maintenance that should have been done anyway. This work found and fixed many things before they could cause problems like won't crank, no spark, no fuel, no power... A reliable machine is not an accident. Neglect is the mother of all problems. I liked the metallic silver and felt it was better than making a poor attempt to match the "correct" Ford gray. Any paint will keep it from rusting. In the future, I intend to try a little harder to match the original colors. 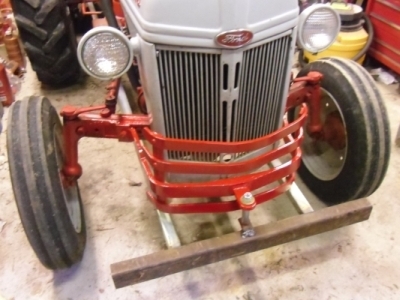 This was intended to be a "working" tractor, not a restoration. These pictures were taken Feb. 12, 2006 after clearing a little snow. That was Fun! The timing was perfect. Grading the driveway and other chores for the last few months helped a lot. Icy patches and one deep spot could have been bigger problems with less time to become comfortable using brake pedals to help steer. Maybe I should have run my tractor longer without live hydraulics so I would fully appreciate how much better it is to have a lift that works independant from the clutch pedal. Whaddyamean you have to take it out of gear, and let the clutch pedal up to raise the implement? 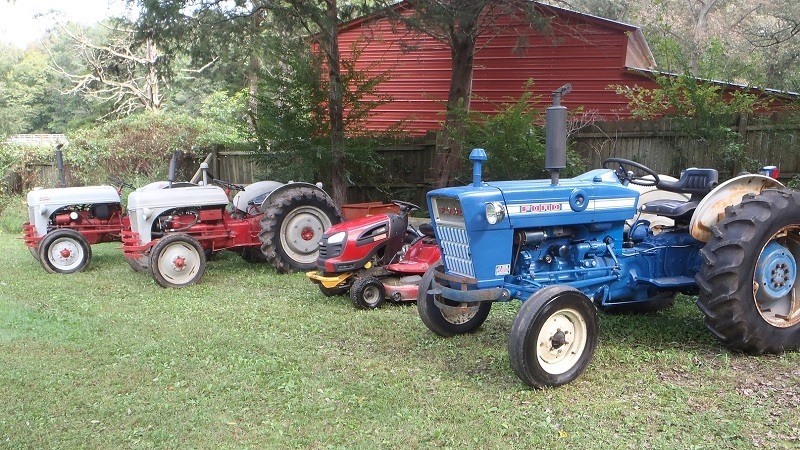 Yep, that really was normal for these tractors. Fortunately adding live hydraulics is as simple as adding an engine driven hydraulic pump and two hoses. The most difficult part of that is making a bracket for the pump. 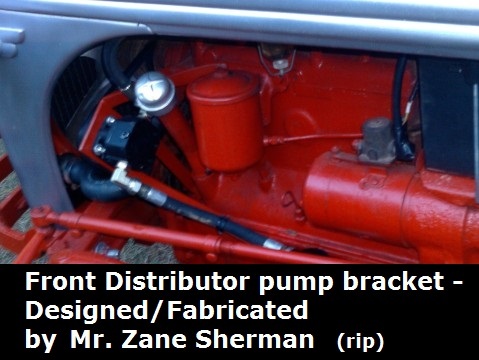 The pump bracket pictured below was designed and fabricated by Mr. Zane Sherman (1935-2018) inventor of the "Zane Thang", a position control device for the hydraulic lift on the Ford 9N, 2N, and early Ferguson tractors. If you like to tinker, I have designed several pump brackets for the 9N, 2N, 8N engines. The pump bracket is the only part that requires custom fabrication. Everything else required to add live hydraulics is standard hose and fittings that anyone can buy locally much cheaper than they can be provided as a kit. Look for a complete shopping list and system description on my LIVE HYDRAULICS pages. 1 - Exhaust Fumes were a frequent problem when running a blade in reverse or using stationary implements. 2 - The low exhaust would heat the right lower lift arm and implement hot enough to burn fingers when changing implements. 3 - The low exhaust can be a fire hazard when running a bushhog in tall grass and weeds. 4 - The muffler will heat the right footboard (Winter = Good, Summer = Bad). 5 - On wooded trails the vertical exhaust clears cobwebs. That is better than using my face. 1 - The vertical pipe will catch low-hanging limbs. 2 - It is not Original. 3 - In some conditions the vertical pipe can form a cloud of exhaust fumes right at nose level. 4 - It can be easier to burn fingers with more of the exhaust easy to reach. 5 - Hot exhaust pipe wraps around carb. This could cause problems. Most of our property is wooded. The low branch problem is easily solved by trimming branches. There are some one-piece vertical pipe kits, but most kits sold on-line will be in pieces. It's much less expensive to ship things that can be broken down into a smaller package. I prefer the kits in pieces. It is easier to modify pieces and easier/cheaper to replace the muffler and vertical stack if/when they get damaged. Install the "U" shaped bottom pipe to the manifold first, then attach the clamp to a head bolt. Make this assembly as sturdy as possible. A thinner gauge vertical pipe for the vertical stack going up from the support brace provides a "fuse" that will break if the exhaust does get caught on something. It can bend or tear completely free without damage to the bottom part of the system. Replacing the vertical straight pipe is cheap and easy. This is my home-made backhoe attachment. This was designed specifically to fit my Ford 8N tractor, and fits much better than any of the aftermarket ones. Built in 2005, it has proven to be very useful. It was certainly a major project. There were a few design flaws. Most were easily fixed. Additional Photos and information about the backhoe are on my Backhoe Page. 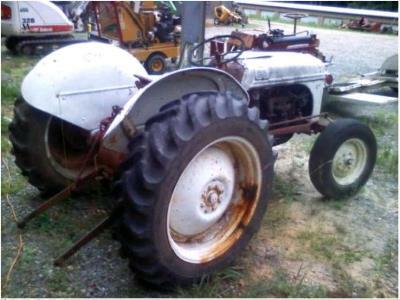 This tractor was for sale in the nearby town of Charlottesville, for a much better price than my first tractor. The roll-back dropped it in our driveway on 01-JUN-2006. It's a nearly original 1952 8N with mostly straight sheetmetal. It still had the 6-volt system, and the generator was charging. Oil pressure looked great, and steering was tight, but the brakes were really messed up, and the exhaust stack was leaking. 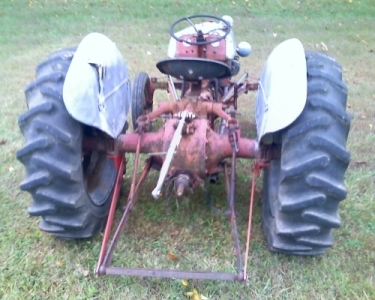 You can find step-by-step photos and descriptions of the repairs HERE..
My wife spotted this tractor for sale "with implements" right down the road. It was close enough to drive it home, and we only had to cross one major road. Some of the sheetmetal on this one is not original. This tractor was converted to 12 volts, but the alternator was not charging. Oil pressure looked great, and steering was reasonably tight. I saw lots of recently replaced parts like starter, carb, drag links, etc. It also came with a small box of old parts. Step-by-step photos and descriptions of the repairs to this one are on my 46-2N Repairs Page - HERE. 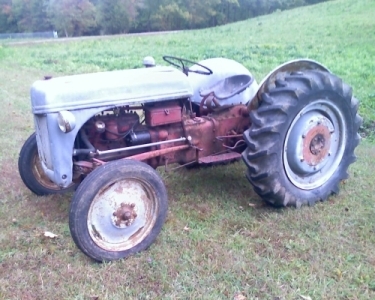 Be prepared for a saga, the 2N took over a year to finish, mostly because I already had a working tractor. A deal I couldn't pass up. This looked like an ebay auction that was going to sell very low, and it was not too far away. the ad was for a 9N. The pictures were obviously 8N. This one has become my flathead V8-8N project - HERE.. The 2N was a saga, this one became an epic adventure. It took a while but I finally found a second original bumper for the 2N. It looked so good, I had to add the bottom rail back on the 8N bumper. The photo of the 8N also shows one version of my tree pusher. 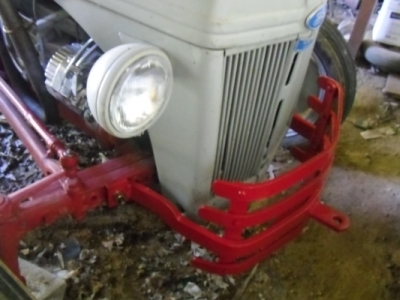 This is attached to the frame of my cutter and is much better than using the tractor bumper and headlights to push saplings over. The cutter is a 5-footer that I fixed, and keep fixing. The blade hardware is so completely frozen, the only way it's ever going to come loose is with a cutting torch. Since the bolts won't move, the only way to keep the blades from sagging is to keep adding weld beads to the stump jumper. That is a piece of used conveyor rubber on the front. The rubber does a good job knocking down missiles a cutter tends to launch out the front. For it's size this cutter is fairly easy to maneuver in the woods. The rear corners are cut on a diagonal. It will slip past obstacles much better than other cutters that are just a big square box. The "tree pusher" bumper worked well, but I stopped bothering with it once there were no more saplings to run over. WHY BUY A FORD 8N? My original decision to buy a Ford 8N Tractor was not by accident. Mostly it was for economic reasons. Something larger than my Craftsman mower was obviously needed, but we could not afford to spend over $6000 for a new tractor. CLICK HERE for my list of pros and cons that justified my decision to buy a Ford 8N. A more recent photo taken March 2017. I was using the logging chain to drag a few dead pines off the slope along the driveway. No, it didn't come with a warranty. Yes, I am a sick person, who needs lots of therapy. 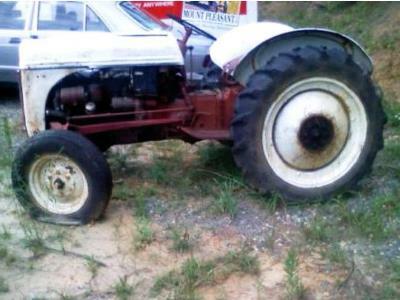 Having trouble with your tractor? 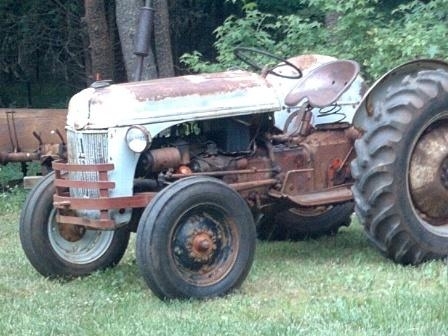 These old tractors are very reliable and easy to work on. They often continue to start and run for many months with little or no maintenance. Eventually, neglect will take it's toll. Many of the messages I get from people having problems start something like, "it started acting up last year, and now it won't start". Most of these tractors are way behind on basic maintenance. The good news is they are usually simple to repair, and much of the maintenance is zero cost. 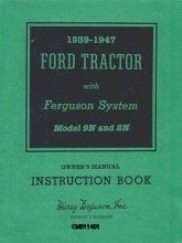 If you get in over your head or just have questions, here are the best sources of Ford 9N, 2N, 8N Tractor information that I have found. 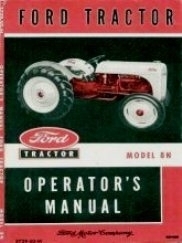 FIRST, before you do anything else, get a copy of the owners manual and the I&T FO-4 shop manual for your tractor. Both are readily available from dozens of on-line retailers or on ebay. You can get hard-copy reprints, electronic manuals on CD, and even original manuals. The information and diagrams in these manuals should be the first place you look for answers. The images below are linked to the site that sells manuals on CD. That's what I use. Here's another link to some digital manuals, if your tractor is a 1000 series or newer. agmanuals.com. This site was just getting started when I put up this link. He should have more manuals available now. Sooner or later you will hit something that is not covered in the manuals. Check out the links below and additional resources on my LINKS PAGE. Search the archives or help areas of other linked sites and you will probably find all the help you need. If not, post a question on one of the forums. You will find a bunch of nice folks who are more than happy to help. 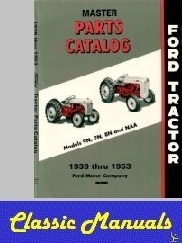 These are the best sources of Ford N-Series tractor how-to information I have found. The people who use these forums are usually very friendly, knowledgable, and helpful tractor people. Just remember that free advice is sometimes worth exactly what you paid for it. As long as you stick around, and read enough to avoid the occasional brain fade or typo, 99% of the advice you get on these sites is the best information you will find, anywhere. For parts or implements, you can browse my PARTS PAGE but you will most likely find a better deal at one of my links on my LINKS PAGE. My comment about "free advice" applies to this site as well. If you find any errors, Please don't hesitate to contact me. I've added a handy contact form to my CONTACT PAGE. What do we know about, The Force? "Very good, young padawan, but you still have much to learn." "Patience you must have, young padawan." "When gone am I, the last of the Jedi you will be."